What better way to create the feeling of an indoor jungle than introducing the perfect tropical vine. Both exotic looking and easy to care for, Passion Flower (Passiflora incarnata) is one of the most interesting flowering vines around. This tropical vine can be easily grown indoors to create a beautiful tropical setting. The Passion Flower is a beautiful tropical-looking vine, though not native to tropical regions. 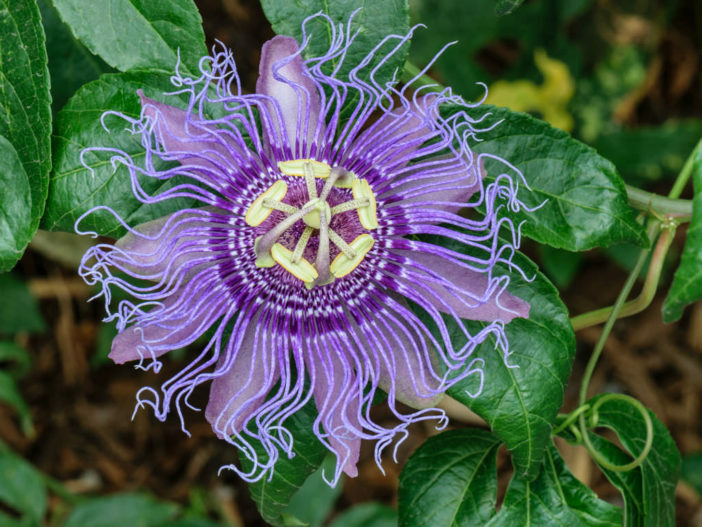 In spite of its tropical appearance, the Passion Flower, also known as the Maypop because it pops out of the ground in May, is actually native to the southeastern United States and can be seen growing along roadsides, open fields, and even in some wooded areas. Passion Flower was named by early missionaries in the early 1500s, who believed parts of the plant symbolized features of the crucifixion of Christ. For instance, the flower’s five petals and five petal-like sepals were said to represent the ten apostles who remained faithful to Jesus throughout the Passion suffering and death. In addition, the flower’s circle of hair-like rays above its petals was thought to suggest the crown of thorns upon Christ’s head. This tropical-like vine prefers indoor temperatures that remain between 55 to 65 °F (13 to 18 °C), but will tolerate slightly cooler conditions during winter months. While it enjoys lots of light, avoid any direct sun. Keep Passion Flower watered regularly while the plant is actively growing and be sure to provide it with adequate drainage. Once fall begins getting closer, you can allow Passion Flower to dry out some between watering intervals but not completely. This plant also appreciates good ventilation when grown indoors. Potted plants can be placed outside in a warm sheltered spot during the summer, if desired. They generally begin blooming in July and continue until frost outdoors, even longer inside. The vines can also grow up to 15 feet (37.5 cm) in a season. Provide a trellis or other suitable support system for this vine, and Passion Flower will reward you with unique and beautiful purplish-blue flowers. There are numerous species of Passiflora in other colors as well, such as yellow, and all species produce edible fruits, ranging from 0.5 to 6 inches (1.3 to 15 cm) in diameter. These fruits also vary with shape and color depending on the species grown, from round to oblong and yellow to purple. If you’re looking for something different to add an exotic presence to your home, look no further. Passion Flower is certainly a good choice. It’s relatively carefree, quite exquisite in appearance, and the flowering vine is filled with a rich history.